Black mold is one of the more unpleasant results of excessive humidity and damp. Molds come in thousands of forms and are essential to the global ecosystem. The many species include types adapted for life in very warm conditions, "thermophiles", and others that can thrive is extremely cold environments, such as those found in Antarctica or a kitchen refrigerator. Molds reproduce by releasing spores which are invisible to the naked eye and can be air-borne or may become attached to surfaces such as our clothing or the hair of our pets. In this way they can be propagated in any place which provides suitable conditions for growth. Where conditions are not suitable the spores may remain in a dormant state for long periods, ready to begin their cycle of growth and reproduction when they have the temperature, moisture and nutrients they need. Mold spores are present in every home and it is virtually impossible to prevent such tiny organisms gaining entry. In most cases the presence of these spores goes unnoticed due to their small size and the lack of impact they have on our lives. If conditions change, however, mold spores will grow and will become visible as they cluster in colonies, known as mycelia (singular form: mycelium). Only a relatively few mold species will be found in our homes but black mold and some other varieties are not only unsightly and damaging to porous materials such as paper, clothing and leather, but represent a health hazard if allowed to grow. The mold we can now see produces millions of additional spores which can spread throughout the home. It is the spores that affect our health. For many people, with a balanced immune system and no susceptibility to allergens the health consequences are relatively minor and may even go unnoticed. For the millions who are less fortunate consequences may include allergic reactions of varying severity including watery, itchy eyes, a chronic cough, headaches or migraines, difficulty breathing, rashes, tiredness, sinus problems, nasal blockage and frequent sneezing. Where an individual's immune system is not functioning effectively mold spores may even begin to grow in the respiratory tract with potentially more serious health consequences. Some varieties of mold produce "mycotoxins". There is considerable controversy in the scientific community about the health risks presented by mycotoxins and we shall not contribute an opinion. Suffice to say that mycotoxins are alleged by some authorities to have contributed to neurological problems and even death in rare cases. It should be stressed that not all molds produce mycotoxins and cannot be classed as "toxic molds". 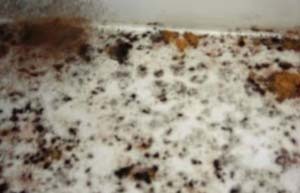 One variety which does, however, is Stachybotrys chartarum, commonly known as "black mold". What is uncontroversial is the effect of mold spores on individuals who suffer from mold allergies. More extreme reactions may be caused in those with compromised immune systems and mold infection has been identified as a cause of illness and death in those whose immune system is extremely dysfunctional, such as those suffering from AIDS. Leaving to one side the health and physical comfort issues, mold of all types found in the home is unsightly, produces unwelcome odours, compromises hygiene and does material, sometimes irreparable damage to items of monetary value, such as clothes, decor and furnishings, and of intrinsic value, such as treasured photographs. In summary, mold, particularly black mold, in the home is bad news and most of us want to avoid it or get rid of it. This page is essentially about prevention rather than cure but if you already have a problem with black mold, or any other mold, there is clearly too much moisture in the area concerned. If the water has entered suddenly, due to flooding, a leaking roof, damaged drain or a similar cause remedial measures to prevent a recurrence are essential. If you have suffered a huge influx of water you may need the services of a water damage restoration specialist who will almost certainly use one or more powerful dehumidifiers as part of the array of equipment deployed to dry out your home. These catastrophic events are, thankfully, relatively uncommon. It is much more likely that black mold has appeared, or is likely to appear, due to high relative humidity somewhere in your home. Proper ventilation may help but will be ineffective, indeed counterproductive, if the outside air contains more moisture than the inside air. When moist air mixes with drier air the relative humidity tends to equalise, that is to say the wet air makes the dry air wetter, or vice versa. As the air outside a home is of hugely greater volume than that contained inside ventilation will only make the relative humidity inside roughly equal to that prevailing outside. Air conditioning does reduce the moisture content of internal air but the operation of the air-con system is governed by temperature not humidity. The air-con is likely to be switched off by the thermostat before a "safe" level of relative humidity is achieved. This is even more likely if your air-con system is "over-sized". If a home with a total floor area of, say, 3000 sq ft has an air-con system installed with the capacity to handle the air across an area of 5000 sq ft it will reduce the temperature to the selected level far more quickly and well before it has reduced relative humidity far enough to prevent black mold and other molds from growing. A relative humidity level no higher than 50% is required to prevent common household molds from growing and reproducing. In many situations this level will only be achieved by using a dehumidifier, whether or not a home has air-conditioning. 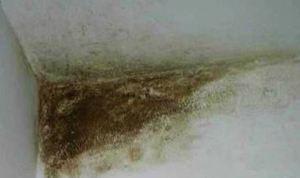 Black mold is not the only problem caused by excessive humidity. 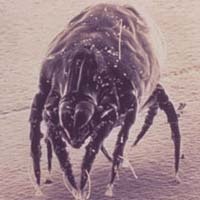 Another source of allergens is the ever present dust mite. Dust mites inhabit our homes in huge numbers and are a major source of allergens, contained in the faecal matter and partially digested dust particles they deposit. Asthma sufferers are particularly at risk from these allergens but they can trigger a variety of allergic reactions including itchiness, sneezing, inflamed or infected eczema, watering/reddening eyes, sneezing repeatedly and frequently, runny nose and clogging in the lungs. There is no way to rid a home of dust mites but their numbers may be kept within tolerable limits by controlling relative humidity. Coincidentally, perhaps fortunately, the magic number is again 50. Dust mites need a damp atmosphere to thrive and maintaining relative humidity at 50%, or a little lower, will keep their numbers under control and significantly reduce the quantity of allergens in the air. In addition to the magic number, 50, there is another connection between dust mites and black mold, or any mold. A dust mite does not have a stomach, as we would understand it, and has to consume food that has already been partially broken down. A major part of that food has been partially decomposed by fungi and, of course, black mold is a form of fungus. In order to inhibit the growth of black mold we need to maintain a relative humidity no higher than 50%. By maintaining relative humidity at or below this level we not only prevent black mold from flourishing, we also make the area uncomfortably dry for dust mites and mold mites and we vastly reduce the food supply that supports the mites, a win - win - win situation. For allergy sufferers the most important area in which to control humidity is the basement and/or crawl space of the home. These areas tend to have the highest relative humidity in the house and the allergenic materials are carried up through the house by rising currents of warm air. Controlling humidity in these areas is the single most important step to reducing, even eliminating, the health problems caused by black mold and mites, both dust mites and mold mites.